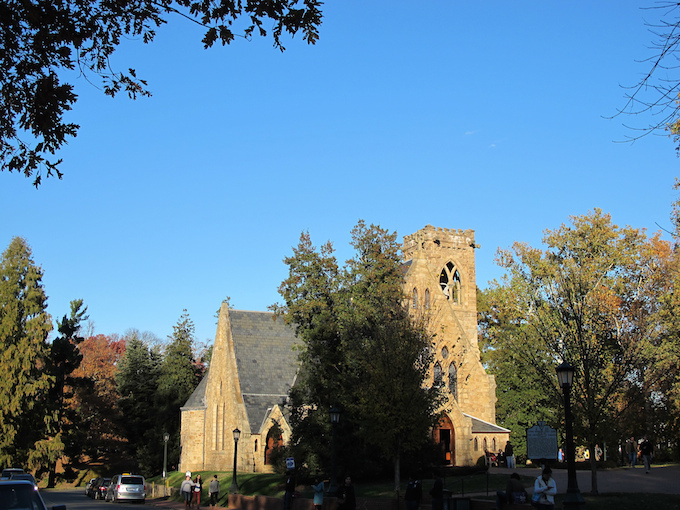 UVA chapel. Bill McChesney via Flickr. Law and religion point to the deepest questions of our existence, but they exist in the world only in their particulars: not “law” as such, but a liberal understanding of constitutional reasoning, or a conservative view of statutory interpretation. Not “religion” as such, but Roman Catholicism, or Sunni Islam. There are no such things as beliefs, rituals, or adherents in “law” or “religion” in general. The particularized forms of law and religion are sustained by tradition-dependent practices—communities of people and institutions with histories that shape their purposes and values. These practices are constantly renegotiating both their internal norms and their relationships to the world around them. The interaction between people who hold different and particularized beliefs leads to the challenge of pluralism—the fact of deep and incommensurable difference around us. We don’t choose pluralism; rather, we encounter it in the world as we find it—a world of competing religious and legal claims and practices. I see three responses to the challenge of pluralism: chaos, control, or coexistence. Chaos is not sustainable in the long-term. It falls flat as a political possibility. It leads ultimately to a violence that destroys lives. Fifteen years ago, I sat in the Pentagon as people who saw only the possibility of chaos smashed a plane into that building. Avoiding chaos is a matter of survival. Control finds its logical end in either theocracy or totalitarianism. Some people in our country are lured by this possibility of control. We have seen this most starkly in the nostalgia and nativism from some on the Right, but we also see it in the moralistic assurances by some on the Left, who believe that opposing viewpoints are simply bigoted or ignorant and therefore worthy of suppression. Neither chaos nor control represents the best of this country or its people. I have been writing lately about the third possibility of coexistence, through what I call confident pluralism. Confident pluralism argues that we can and must live together peaceably in spite of deep and sometimes irresolvable differences over important matters. We can do so in two important ways—by insisting on constitutional commitments that honor and protect difference and by embodying civic practices in our speech and our relationships across difference. Instead of shutting out or shutting down those with whom we disagree, confident pluralism suggests that we find space for meaningful difference and the opportunity for persuasion. Confident pluralism focuses on three principles: tolerance, humility, and patience. But tolerance does not require embracing all beliefs as equally correct. Instead of an “anything goes,” happy-go-lucky tolerance, we can embrace a practical enduring of difference. That does not impose the fiction that all ideas are equally valid or morally harmless. It does mean respecting people, aiming for fair discussion, and allowing for the space to differ about serious matters. The second guiding principle is humility, which recognizes not only that others will find our beliefs and practices objectionable, but also that we can’t always “prove” why we are right and they are wrong—some of our most important beliefs stem from contested premises that others do not share. We act on these beliefs with trust and faith—there is no other possibility. The third guiding principle is patience. Patience encourages efforts to listen, understand, and even empathize. That does not mean endorsement, or recognition, or acceptance. In fact, it may turn out that patience leads us to a deeper realization of the error or harm of an opposing viewpoint. But we can at least assume a posture that moves beyond dismissing others before we hear what they have to say. Confident pluralism imagines the bridges that we can build across difference. This bridge building may not often overcome ideological difference. We are unlikely to find agreement on all of the difficult issues that divide us. But we can work to bridge relational difference. We can come to know each other as human beings, and work toward finding common ground. It seems to me that the university is one of those institutions that could best embody these possibilities, fostering genuine dialogue across difference. But today’s university falls short of these aspirations when it misses the importance of ideological and religious diversity. Without the ability or the avenues to air real differences, genuine dialogue occurs less frequently, and contested assumptions go unchallenged. Tolerance becomes a demand for acceptance, humility is supplanted by moral certainty, and patience loses to outrage. The reality of the differences among us, including our religious differences, is such that we will not finally have agreement on all of the issues that matter. That is true in our society, and it is also true in the university. This fact of difference puts immense pressure on the coherence of our shared endeavor. We can, of course, name general goals for the university: We train lawyers, we educate students, we pursue scholarship. But can we say anything more about its purpose? Campuses still cling to speech codes and other restrictions on expression…seemingly without understanding that these policies not only chill speech but also teach students that an open exchange of ideas might not really be such a good thing…. [And now] the tactics and attitudes that shut down speech on campus are bleeding into the larger society and wreaking havoc on the way we talk among ourselves. Many members of the university community are making such efforts, but we have a long way to go. The past few weeks have seen renewed national attention to debates about safe spaces and trigger warnings. There are serious arguments on both sides. But I don’t think we can say the university itself, or its classrooms, are safe spaces. One cannot read a single page of Nietzsche and be safe. One cannot be safe with the Bible, the Koran, Judith Butler, or W.E.B. DuBois. Texts that are written to challenge, unsettle, and transform are not meant to be safe. This brings us back to law and religion. Both play a central role in unmasking our disagreements and unsettling our expectations. Religion asks us to take seriously the disagreements we have over some of life’s biggest questions. Law gives us the rules of the game that allow us to live together in spite of that conflict and disagreement. Religion and law can lead us to choose coexistence over chaos or control. They are particularly important in the university, which draws students and faculty from the world, which affords us a proximity of space and time with one another, and which models a kind of discourse that our graduates carry with them in their next steps. I hope that the university can be a place for what MacIntyre calls “constrained disagreement.” A place that initiates students into the kind of conflict through which people learn to live together rather than fracture through indifference, apathy, or violence. This country, now as much as ever, needs such places. We are quickly losing the ability not only to see different perspectives, but even to see the humanity of those with whom we disagree. I know, of course, that naming the university as a particularly important institution for practicing constrained disagreement risks conveying self-importance and navel-gazing. But I want to take seriously the privilege and responsibility of the positions we occupy. The vocations of teaching and writing bring with them the luxury of time. With our colleagues, and with our students, we have the space not only to express disagreement in more than tweets and sound bites, but also to probe the reasons underlying our disagreement. We have the opportunity to make mistakes and to learn from them, and in doing so to forgive one another. We have the possibility of developing the habits of tolerance, humility, and patience that enable us to coexist in spite of real and deep differences. These are the possibilities of the university. And taking seriously the claims of law and religion will help us discover them more fully. John Inazu is a senior fellow at the Institute for Advanced Studies in Culture and the author of Confident Pluralism: Surviving and Thriving Through Deep Difference. He holds the Sally D. Danforth Distinguished Chair of Law and Religion at Washington University in St. Louis. This essay is adopted from his September 7, 2016 lecture marking the installation of his chair.